Buses are the main form of long-distance public transport in Peru. For most travelers, especially those on a tight budget, Peru’s buses provide a cheap way to get from place to place. It’s important to remember, however, that not all buses, or bus companies, are created equal. For reasons of comfort, consistency and, more importantly, safety, you should stick with the more reputable and reliable bus companies whenever possible. How Safe is Bus Travel in Peru? Peru has a shocking record in terms of traffic accidents and fatalities. According to a July 2011 report by The Peruvian Times (quoting statistics released by Peruvian insurance association APESEG), there were 3,243 deaths and 48,395 people injured on Peru’s roads in 2010 alone. Bus accidents certainly contribute to these figures, with fatal accidents reported regularly. The majority of these accidents, however, involve low-budget bus companies with poor security features and antiquated fleets. Traveling with the midrange to top-end companies doesn’t guarantee a safe ride, but it vastly increases the chances of a problem-free journey. Speed limiters, regular driver rotation, and well-serviced buses help ensure a safe trip. Furthermore, the top-end companies collect passengers from designated areas only (normally their own terminals), rather than off the street. This greatly reduces the risk of onboard crime such as theft or, in extreme cases, hijacking -- particularly important when taking a night bus in Peru. Traveling with the midrange to top-end Peruvian bus companies is certainly the way to go (unless you want to fly, of course). 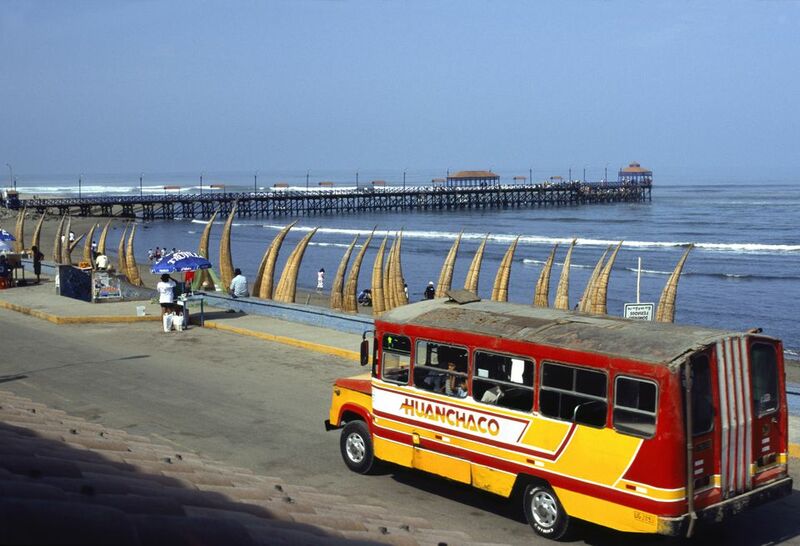 Some alternatives to these major Peruvian bus companies include Peru Hop, a relatively new hop-on hop-off bus service, and 4M Express, both of which operate along the tourist routes in southern Peru. The top-end Peruvian bus companies, such as Cruz del Sur and Ormeño, have networks that serve towns and cities across much of Peru. Others are regional in extent but often travel along roads not covered by the larger, more luxurious companies. Movil Tours, for example, is the best option for the trip inland from Chiclayo to Moyobamba and Tarapoto. While you can reach most major towns and cities with the established bus companies, there are some exceptions. No major bus companies travel along the road from Tingo Maria to Pucallpa, or from Tingo Maria to Tarapoto. Smaller buses do run along these routes, but shared taxis remain the safest and most comfortable option. Boat travel, of course, becomes the norm once you enter the vast jungles of Eastern Peru. In the northern half of the country, highways stretch east only as far as Yurimaguas and Pucallpa. From here, you must either hop on a boat or take a flight if you want to reach the city of Iquitos on the banks of the Amazon (Iquitos is the world’s largest city not reachable by road). Traveling in Peru by bus can be a surprisingly pleasurable experience – unless you’re intent on using the low-end companies. There are plenty of aged, fume-belching monstrosities on the roads of Peru, as well as the so-called “ chicken buses” common in parts of South and Central America. For long-distance travel, these buses are nothing but torture. A 10-hour or more bus ride is rarely fun, but the experience is far more bearable with Peru’s more expensive and well-equipped buses. With Cruz del Sur, Ormeño, Movil Tours and the like, you’ll have features such as air conditioning, passable onboard meals, recent movies and reclining semi cama or full cama bed seats. The fleets are often comparable to similar companies found in North America and Europe -- at times even better. Many of the higher-end fleets use modern buses with two decks. For greater comfort, and more personalized attention from the terramozos (the bus hosts), pay a little bit more for a seat on the lower deck. Bear in mind that comfort also depends on the quality of the roads. If you’re traveling along the Pan-American Highway, either along the north coast of Peru or down south, hairpin turns and potholes are not too common. Swinging around Andean peaks or along crumbling jungle roads, however, is a different story altogether. Bus travel provides a reasonably cheap way to get around Peru. It is often time-consuming, but it’s a good way to see more of the country while avoiding the expense of flying. This particular route from Lima to Cusco by bus takes about 21 hours. Rival companies have comparable prices along this route and others, but you’ll often pay a few dollars less when you travel with less luxurious -- but reasonably dependable -- operators such as Movil Tours, Flores and Cial (depending upon the class of bus). One particularly useful tool for anyone traveling in Peru by bus is Busportal. The Busportal website lets you easily compare prices, check schedules and buy tickets for most of the major bus companies in Peru.